This is about a middle aged couple. The husband who was otherwise successful in his career was still short of something. Something about what his wife was too much bothered. It was his Hair Loss or bald looks. Since past one year she has noticed that her husband was losing his hair very fast. His Hair Loss had made his head come out of his once so swanky hairs. She had searched a lot on google about Hair Transplant. She had found out how effective and life changing a Hair Transplant procedure is. She learnt about Strip (FUT) technique of Hair Transplantation and FUE technique of Hair Transplantation over the internet. Though her husband had sufficient hair over the back of his head but she also read about Body Hair Transplant (BHT) technique. She was fascinated about the robotic Hair Transplant also. She had also viewed the videos of Hair Transplant on the YouTube. Though money was not an issue but she felt that robotic Hair Transplant is not worth the pain and the results might not be so good. She had also searched the google for various non-surgical or medical treatment for Hair Loss. Among them she was really fascinated by seeing the results of platelet rich plasma (PRP) treatment for Hair Loss. She did her graduation in biology and hence it took little time to understand the science behind Platelet Rich Plasma therapy. She felt that Platelet Rich Plasma treatment for Hair Loss is the best treatment modality among all the medical treatment options for Hair Loss. She felt that there is no side effect or adverse reactions of platelet rich plasma treatment for Hair Loss. She was not much impressed by some of the other fancy name medical treatment options for Hair Loss. Finally after doing a lot of research she decided that her husband must undergo Hair Transplant. Now came the most difficult task: how to convince her husband for Hair Transplant. One day she found an opportune time and discussed with her husband about how his Hair Loss is bothering her since several months. She also told him that she had studied a lot about the treatment options for Hair Loss. She told him that his Hair Loss keeps her bothering day in and day out. She suggested him that he should think about getting hair transplant done. Her husband took a deep breath. He was not aware that his Hair Loss problem is bothering his wife also since such a long time. Though he was also feeling slightly low due to his Hair Loss problem but this thought never came into his mind that this is also affecting his family life. 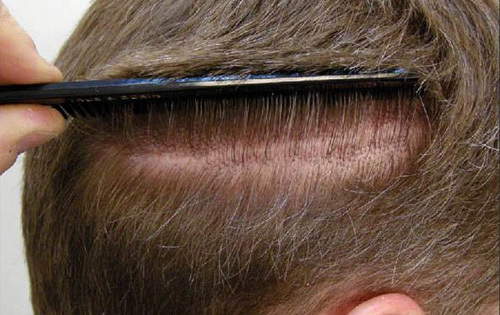 He asked his wife to give him some time to think over it and to make up his mind for Hair Transplantation. For the past many months he was also worried about his Hair Loss problem and had done lot of searches for it. He had also gone to few Hair Transplant centers in Delhi to discuss about the Hair Loss problem. After few days he got back to his wife and told her that now he has made up his mind for Hair Transplantation. He had never seen such a good smile on her face since a long time. He also smiled back but from inside he felt guilty with the thought that he had deprived his wife of happiness since many months. She went close and hugged him tight. Next day they went to a Hair Transplant specialist and booked an appointment for Hair Transplant procedure. Her husband has undergone Hair Transplant procedure few days back and now she is on the top of the world. She told me that thanks to the Hair Transplant procedure she has got her hubby back.